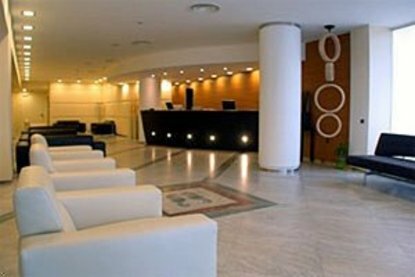 In the heart of the city, the Best Western Hotel Mediterraneo represents the ideal climate for your personal business and relax. A top restored 4 stars hotel in the historical and commercial area of Ragusa satisfies all requirements of business customers and tourists. It is located few steps from Ibla, the old baroque city, an Unesco's property. Competence and courtesy, solicitous but at the same time discrete attention are the qualities of a comprehensive service ranging from the practical aspects about travel or sight-seeing information to a well made cocktail, to a tip for an evening out or an idea for a present. The hotel staff is happy to welcome you and you can rely a prompt reception, efficient service and helpful tourism information for your leisure time. The 92 rooms offer high quality standards: bathrooms with hairdryer, mini-bar, very comfortable beds, safe, air conditioning, telephone and satellite TV. All rooms are designed to offer a relaxing atmosphere to the tourist looking for a rest, as well as provide businessmen with facilities similar to what they are accustomed to in their office.